I decided to pick this up audiobook because so many of my fellow readers loved this book hard. I can see why LOVE AND OTHER WORDS connected with so many readers, but I didn’t entirely feel the same level of adoration to the story as a whole. Through past/present storytelling, Christina Lauren takes the reader on a journey back to Elliot and Masie’s past from when they first met through when they fell in love and later fell apart. Eleven years after their breakup, the two meet again and Elliot is just as in love with her as he was as a teenager. But one problem—Masie is engaged. Christina Lauren almost always writes delicious red-hot chemistry with great banter and dreamy heroes. Those things are present in Love and Other Words. Even though Elliot’s character fell into the “too perfect to feel real” category, I still swooned hard over his intelligence, nerdiness, and sweetness. Lauren built up their love story as children so well, showing the reader how these two bookworm nerds fell hard for each other over the course of several years. I loved reading their past love story. In a way, we got a what I like to call a “double love story” because we got to see them fall in love twice. This book made me feel addicted to it because I kept needing to know what happens next. I love it when that happens! This is Christina Lauren’s first foray into women’s fiction, so I was curious to see how their writing talents transferred into this new genre for them. My biggest question was how they were going to craft the conflict. In the past, the conflict in some of their stories hasn’t been the strongest, which causes the whole story to deflate when it should be exploding. In an attempt to explain away some of the plot contrivances, Lauren asks the reader to believe a lot. Somehow, Elliot didn’t know that Masie’s dad had passed away. After being best friends for years and deeply in love, Elliot didn’t aggressively attempt to reach out to Masie. On the flip side, Masie didn’t want to talk over what she saw with Elliot? I don’t buy it. If she was that in love to drive hours to see him that night, that same girl would have been pounding at his door and shoving at his chest screaming, “WHAT THE HELL? !” Neither Elliot nor Masie ever met their mutual friends in nearly six years of friendship, until the night they broke up. Masie was engaged when she sees Elliot again. But it’s a little too convenient that her fiancé is not really that in to her and was totally fine with her ending it. 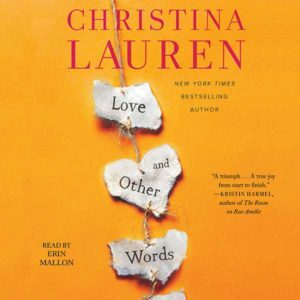 Both characters felt like the same character type we’ve seen in other Christina Lauren type books. We have the really nerdy sensitive guy and the female professional whose profession didn’t really play a part in her character. Though, I did like see Lauren write a story with everyday people, instead of high-powered executives we’ve seen in the past. With this being billed as women’s fiction, I was expecting to see more of an interplay between Masie’s profession and her life as well as a more developed emotional arc for Masie’s character. Neither of those things really occurred here. To me, this felt like more of a contemporary romance and less like a women’s fiction novel. Also, Elliot’s life in the present isn’t really explored in any detail either. I couldn’t even tell you what he does or what he likes (aside from Masie and literature). I really didn’t like that we find out that Elliot had been essentially raped, yet this trauma wasn’t explored or dealt with in any way whatsoever. Rather, the focus was on the breakup between him and Masie. I did enjoy reading their love story as teens and seeing them reconnect in the future. If you’re a die hard women’s fiction reader, this book may leave you wanting more. But if you like second chance romance, then I’d recommend you give this one a go (with some reservations), especially to meet the adorable Elliot. I loved the audiobook production here. I’d wholeheartedly recommend the audiobook if you’ve already read it and loved it or if you’re looking a romantic listen with a solid narrator. Erin Mallon’s performance is heartfelt, entertaining, and engaging. I really liked how she narrated the male voices without it sounding hokey. Erin Mallon is one of those narrators whose performance is so convincing. * Thanks to Simon & Schuster Audio for providing me with a copy for review. Receiving this audiobook for free did not affect my opinion.